My last few hours in Melbourne were spent checking out the Shrine of Remembrance and Fitzroy. The seeds of the red Flanders poppies which bloom in this garden around Remembrance Day on 11 November each year, can be traced back to the World War 1 battlefields in Flanders and Northern France. The poppies grow wild in the fields, where many Australians died in battle. Veillers-Bretonneux and other French townships continue to maintain a special link with Victoria because of the sacrifice made by Australian soldiers in Wold War I, which helped save the township from enemy occupation. The poppies led me to a larger building which I later realized was the Edmund Herring Memorial Oval. The building was erected in memory of the men and women who served in the war from 1914 through 1918. Inside, at the center of the building, there was a plaque that read: “Greater Love Hath No Man”. I’m under the impression that this quote comes from the bible verse, “Greater love hath no man than this, that a man lay down his life for his friends” (John 15:13). So true! It is also a gentle reminder in the heart of Melbourne of God’s love for us when He died on the cross for our sins. Furthermore, it makes you appreciate the sacrifice that these men and woman made so that Australians could live the peaceful lives they do today. Inside the building there were stairs you could climb that lead to an outside balcony which offered pretty nice views of the surrounding city, and a cool poppy structure. The World War II Memorial comprises the Eternal Flame, the Cenotaph, the Flagpoles and the Forecourt. It represents a memorial to those men and women who served in the 1939-1945 war. The names of the theaters of war where Australians served are shown on the walls of the Cenotaph. The statuary surmounting the column represents six men- two sailors, two soldiers, and two airmen- carrying a dead bier on which lies the figure of a dead comrade draped with the national flag. 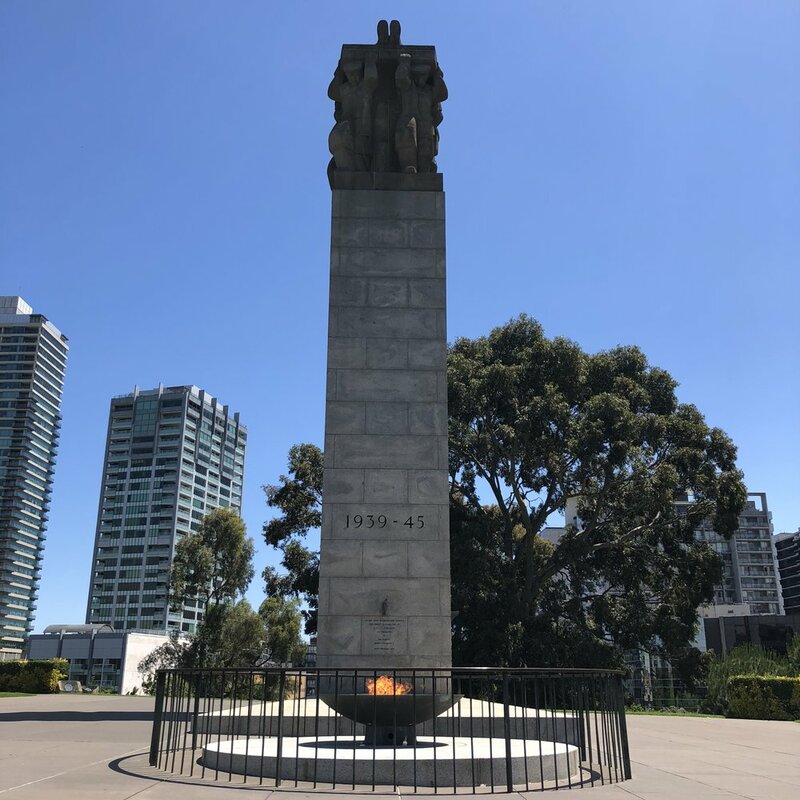 The Eternal Flame has burned continuously in its great bronze bowl since 1954 when it was lit by Her Majesty Queen Elizabeth II at the opening of the forecourt memorial. Next up, I walked Brunswick Street, also known as the Fitzroy area. It’s a street full of cool shops, different cafes and restaurants, funky buildings and plenty of street art! I also grabbed a bite at Hooked, where I ate a bomb plate of fish and chips. I don’t think it was as good as the fish and chips I enjoyed at a spot on the Noarlunga beach pier, but it was close! Overall, I really enjoyed my time in Melbourne, although it was way too short. Nonetheless, I completed everything on my to see/do list! Next time I visit, I hope to stay longer so I can check out all the sporting events (there are many professional sports teams in Melbourne), eat at more restaurants that friends have suggested and spend more time in the museums. Below are some photos from my walk around parts of the city which include: Federation Square, ACMI and other views that I found snap worthy. Australian Center for the Moving Image. Photo taken on St Kilda Road. View driving down Domain Tunnel. Have you been to Melbourne? If so, what sights or activities would you recommend? If not, what would you do in Melbourne if given the opportunity? Older PostMelbourne part 3, Royal Botanic Gardens Victoria!